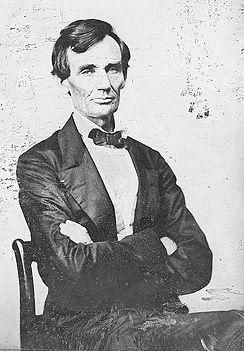 Abraham Lincoln in August 1860, three months before he was elected president. He was inaugurated in March 1861. When Barack Obama is sworn in today as the 44th president of the United States, he will use the same Bible upon which Abraham Lincoln took the oath of office at his first inauguration in 1861. The moment will not be the first where Obama and Lincoln intersect. This weekend, Obama boarded a train to trace Lincoln's own inaugural path from Philadelphia to Washington. And he had, in fact, announced his historic presidential bid from the steps of the statehouse in Springfield, Ill., the same spot where his fellow Illinois politician began his road to the White House. If the new leader of the free world wants to find more ways to mirror the 16th president, he might want to pick up a copy of a new Johns Hopkins University Press release that some critics describe as the definitive biography and seminal re-examination of Lincoln. The full life and times of Honest Abe are detailed in Abraham Lincoln: A Life, an exhaustive and stylishly written biography published by the JHU Press to coincide with the 200th anniversary of Lincoln's birth on Feb. 12. Author and distinguished Lincoln scholar Michael Burlingame, who received his doctorate from Johns Hopkins, infuses a lifetime of research into the 2,000-page two-volume book, which has been hailed by critics and embraced by consumers. The book's initial print run of 1,500 copies sold out in days, and the Press has received additional orders for thousands more. James L. Swanson, a fellow Lincoln scholar and author of the bestseller Manhunt: The 12-Day Chase for Lincoln's Killer, wrote in his Publishers Weekly review that Burlingame has produced the most meticulously researched Lincoln biography ever written. "This book supplants [Carl] Sandburg and supersedes all other biographies," Swanson said. "Future Lincoln books cannot be written without it, and from no other book can a general reader learn so much about Abraham Lincoln. It is the essential title for the bicentennial." Burlingame, the author or editor of a dozen books on Lincoln, said he began work on a full- fledged biography in 1987, though the scope of the book did not take shape until the early 1990s. Around that time, Burlingame uncovered a great deal of new and not widely known information on his subject from such sources as unpublished letters, the field notes of earlier biographers and 19th- century newspapers other than the usual suspects of big-city dailies. "I was somewhat surprised by the amount of new information out there and felt, heck, someone should really write an authoritative cradle-to-grave biography on Lincoln that incorporated all these details," he said. "I decided to undertake the task myself." Burlingame, the Sadowski Professor of History Emeritus at Connecticut College, retired early, at the age of 59, to dedicate himself to this project and complete it in time for the bicentennial. He used some of his research for another book published by the JHU Press, Lincoln Observed: Civil War Dispatches of Noah Brooks. Lincoln Observed, published in 1998, collates the dispatches, selected letters and personal reminiscences of Brooks, the Sacramento Daily Union reporter who had direct access to the president, a longtime friend. In Abraham Lincoln: A Life, Burlingame combines Brooks' observations with others gleaned from decades of research in multiple manuscript archives, long-neglected newspaper articles and Lincoln's own lost journalism. Volume 1 covers Lincoln's early childhood, his experiences as a farm boy in Indiana and Illinois, his legal training and the political ambition that led to a term in Congress in the 1840s. In volume 2, Burlingame examines Lincoln's life during his presidency and the Civil War, narrating in detail the crisis over Fort Sumter and Lincoln's own battles with political rivals, hostile newspaper editors and incompetent field commanders. Some of the book's surprises include a quotation of Frederick Douglass that refers to Lincoln as "the black man's president." Douglass had long been quoted as referring to Lincoln as "the white man's president." It also recounts a speech in 1865 where Lincoln told those gathered that he would allow the black man to vote. One of the attendees was John Wilkes Booth, who was overheard saying that he would "run him through" before Lincoln could do that. Three days later, Booth shot him at Ford's Theatre. Burlingame also offers new and sometimes unflattering interpretations of Lincoln's private life, discussing his difficult marriage to Mary Todd and the untimely deaths of two sons to disease. Burlingame said that through it all — a troubled relationship with his father, career setbacks, a fratricidal war, bouts of depression and tragic personal losses — Lincoln preserved a keen sense of humor and acquired a psychological maturity and strength of character that would inspire millions of fellow countrymen during his lifetime. "And inspire generations to come," he said. Robert J. Brugger, history/regional book editor at the JHU Press, said that this book cements Burlingame's place as the leading Lincoln scholar. "This is the work of an extremely diligent historian. Michael is an indefatigable researcher who has spent his career working on Lincoln and going after evidence both small and extensive that other historians overlooked or simply declined to get into," Brugger said. "Since so much has already been written, some people feel we know everything there is to know about Lincoln. But this book brings fresh insight to a great man and someone who belongs to the ages." The book, $125, is available through the JHU Press Web site, www.press.jhu.edu. The Press and the Alumni Association will host a talk by Burlingame at the Maryland Historical Society on May 20; for more information, contact Jack Holmes at 410-516-6928. GO TO JANUARY 20, 2009 TABLE OF CONTENTS.